A journal bandolier is a strap fitted with small loops for carrying pens, pencils, and other handy tools wrapped around a journal, planner, or other book. Broken pencil points and lost pens drive me mad so I made myself the first journal bandolier. When people kept asking where I had gotten it, it occurred to me that I wasn't the only one looking for a better way. 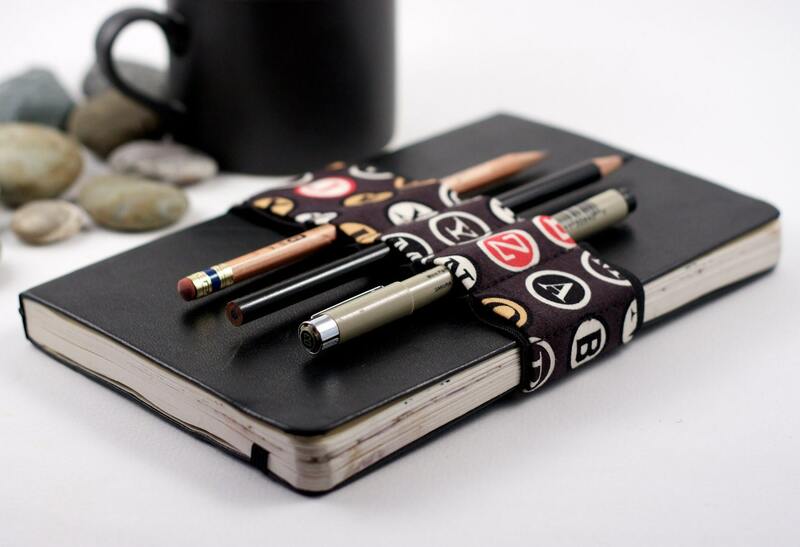 The journal bandolier will keep your pens and pencils at your fingertips and with your journal. Travel light - draw often. - This size bandolier is tailored to fit circumferences from 11.5 to 13"
Because each bandolier is a handmade it may have slight variations from the photograph. The journal is not included. Yup, its true the Journal Bandolier is Trademarked. Perfect for my Hobonichi Techo case that needed a way to keep it shut, plus a better way to carry pens and pencils to use in it. I really love my new pen, pencil bandolier! I had a notebook in mind when I bought it & it fits perfectly. And bonus...it’s much sturdier than I had imagined it to be-VERY well made!